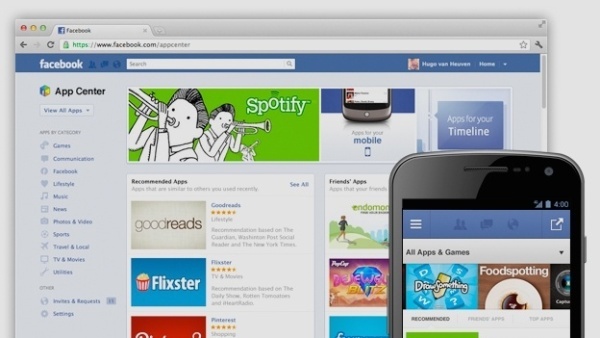 Facebook Announces App Center. Facebook Phone Finally On The Way? Facebook has just announced App Center, a replacement for the old Apps and Games hub users used to find Facebook apps. 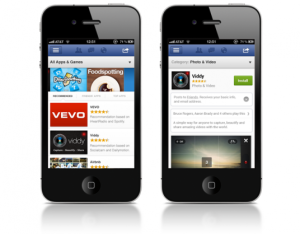 Mobile Facebook users will now be able to directly download Facebook apps from Facebook for the very first time. HTML5 web apps, which don’t require a traditional installation, will be available from App Center itself. More traditional programs that do require an installation, such as OMGPOP's Draw Something, will redirect the user to either Google Play or the Apple App Store. Just as interesting, especially for more traditional developers who may have shied away from Facebook, is the announcement that users will now be able to pay for apps directly. Before application developers had to rely on either advertising or in app purchases to monetize their work. What’s more interesting about today’s announcement was not the press release itself, but the role App Center could play in Facebook’s future. Rumors have it that Facebook is working on a smartphone of its own, beyond its failed experiment with HTC and its 'Facebook button,' that would run a forked version of Google’s Android. The move would make sense—mobile is the fastest growing social market, and Facebook risks being pushed to the sidelines if they don’t aggressively enter the market. More and more people's social networking lives are tied to their smartphones, and Facebook’s being just another application would never justify their high IPO. Rival advertising firms and opposing social networks are already using mobile operating systems to chisel down the gap between them and Facebook. Twitter is buried deep inside iOS, while Google has placed hooks for Google+ throughout sanctioned Android builds. Microsoft, an early investor in Facebook, has integrated the social network with Windows Phone 7, but the operating system continues to lose market share. Even if Windows Phone takes off Microsoft uses Bing for search and marketing—saving much of the available advertising revenue for itself. But if Facebook does build their own phone it won’t be enough for it to just run the best version of Facebook, even though that might be enough to sell devices. Advertising is a lower margin business on phones. Monetizing mobile Facebook users will require Facebook take money directly from the consumer, by selling either services or apps. Services, such as Spotify, that use Timeline to connect with existing users are growing rapidly, but only with the announcement of App Center does Facebook have the mobile portfolio it needs to build a profitable, higher margin phone. Furthermore, support for HTML5, rapidly becoming the de facto standard for cross platform mobile development, will help it capture developers quickly. If Facebook does launch a smartphone they shouldn’t have any trouble finding a hardware partner. HTC, riding high on the recent launch of their One series, has worked with Facebook in the past. The HTC ChaCha, a low-end Android smartphone with a portrait QWERTY keyboard, and HTC Salsa were both advertised as Facebook devices when they were announced. A dedicated hardware button was used to share Facebook updates, but the phones still relied on Google for application support and associated functionality. Samsung has a long history of backing upstart software platforms, including Tizen and Baidu, and has had a less than stellar experience working with Mountain View. Google’s abrupt decision to remove skyhook from certified Android phones in 2010 forced Samsung to ship flagship phones, including the Vibrant and Captivate, with dysfunctional GPS services. ZTE and Huawei, traditionally weak in Western markets, are trying to grow outside of Asia and the developing world—partnering with Facebook would provide the perfect brand to launch their entry into the high end North American and European smartphone markets.